This analysis of internet usage is based on a compilation of 97 surveys and over 229,000 interviews among the general public conducted by the Pew Research Center from March 2000 to May 2015. These surveys are combined, allowing for comparisons of trends among different demographic groups across years. Yearly totals are calculated by combining all surveys for the calendar year with appropriate weights applied. Weighting to adjust for disproportionate sampling and nonresponse reduces the precision of estimates beyond what would be achieved under simple random sampling. In this report, all measures of sampling error and statistical tests of significance take into account the design effect of weighting. 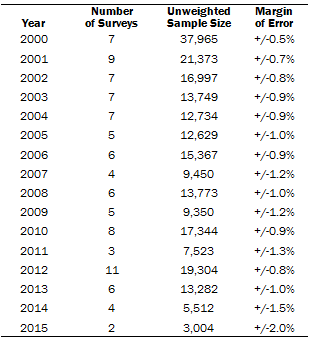 The table below shows the number of surveys and interviews conducted each year, as well as the margin of error for each yearly sample.